Leeds Male Voice Choir is a vibrant and dynamic choir of about sixty men that performs throughout Leeds and Yorkshire. With an inclusive approach our members have different levels of singing experience and come from a variety of backgrounds. We aim to make choral singing as accessible as possible to all men, whilst aiming to achieve the highest possible standards. Formed in 1916 in Middleton in South Leeds, the choir has performed in churches, cathedrals and concert halls throughout Yorkshire, the United Kingdom and Europe. Lead by our Musical Director Tim Knight, our performances offer something for all tastes with an eclectic mix of folk, opera, pop, sacred and classical pieces. The choir selects a diverse range of music music drawn from around the globe with the aim to communicate, engage and entertain. Leeds Male Voice Choir is a registered charity, with the aim of advancing men’s choral singing throughout Leeds and the United Kingdom. The choir performs locally and nationally and has raised funds for a range of local and national charities. The popular free annual workshops encourage men of all abilities and backgrounds to Find their Voice in a supportive learning environment. The Find Your Voice programme has been successfully rolled out to a number of other men’s choir’s in the United Kingdom in support of the overall aim to Get Men Singing. 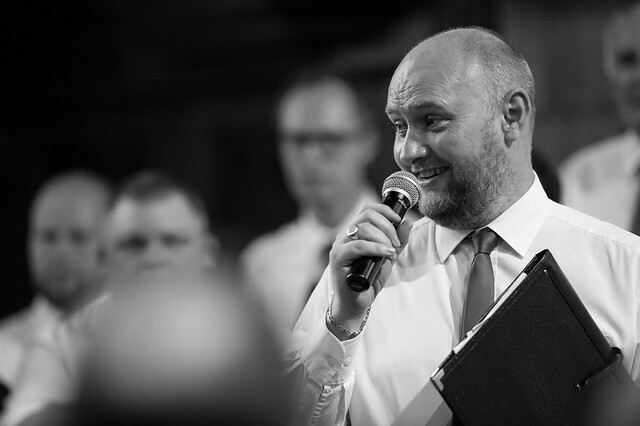 Leeds Male Voice Choir is managed by the Musical Director alongside a Board of Trustees with experience in Retail, Financial Management, Project Management, Governance, Risk Management and Human Resources. John Hickes the choirmaster of Mill Hill Church on Park Row in Leeds had taken over as conductor by the mid 1920’s, with the choir continued to be known as the Broom Excelsior Male Voice Choir until the late 1940’s reflecting a strong bond to the Broom Colliery. However, changes to the colliery in the post war years are thought to have been linked to a decision to change the choir’s name in 1948. The number of colliery workers halved, whilst the colliery was eventually transferred from private ownership to the newly formed National Coal Board at a ceremony in January 1947. The choir performed at this ceremony where the government was represented there by Hugh Gaitskill (the future Labour party leader). Shortly after this the name Leeds Male Voice Choir was adopted, with the first performance conducted by John Hickes in the Belgrave Central Hall (now known as Belgrave Music Hall) on New Briggate, in November 1950. Great success came under the leadership of John Wheeler who became musical director in 1963 with his wife Ursula joining as the choir’s accompanist. John was a principal singer at Leeds Parish Church and also conducted Batley Male Voice Choir and Phoenix Park Male Voice Choir in Bradford. He led the choir and began a series of exchange visits with Leeds’ twin city Dortmund in Germany and return visits became a popular and prominent feature during the nineteen seventies. In 1966 the choir celebrated 50 years in the People’s Hall on Albion Street in Leeds with the Rothwell Temperance Band. By 1971 the choir was a force to be reckoned with on the local music scene, taking first prize in the Robertshaw Music Festival in Bingley. Television appearances followed with the choir taking part in Hughie Green’s Opportunity Knocks and featuring on Stars on Sunday as part of the ‘1000 Voice Choir’, accompanied by the Black Dyke Band at Leeds Town Hall. By 1978 the choir released their first album featuring some of the traditional male voice choir repertoire, with the now famous photograph outside Leeds Civic Hall, which the choir re-created in 2014. Between the 1986 and 1994 under the direction of Nigel Wears, the choir increased in size and scope whilst maintaining its local concert schedule throughout the city and visited the Royal Albert Hall twice to perform in the 1,000 Yorkshire Voices concerts accompanied by the Brighouse and Rastrick and Sellers International Brass Bands, also performing at Ripley Castle with the Halle Orchestra. The choir’s seventy fifth anniversary concert took place in 1991 in Leeds Town Hall accompanied by Sellers International Brass Band with support from a number of male voice choirs including York, Castleford, Micklefield and Liverpool. Between 1994 and 2004 the choir was directed by David Burnett, who maintained a busy and popular concert schedule throughout the city again returning to the Royal Albert Hall to perform in the 1,000 Yorkshire Voices concert. Conducted by Michael Grant following the turn of the millennium Leeds Male Voice Choir, continued to perform at a host of venues throughout Leeds and raise money for local charities. In 2013 under the direction of Will Prideaux, the choir hosted a charity project in aid of Help for Heroes. Many of those that performed in the Sing for Heroes concert in Leeds Town Hall decided to keep singing with the choir. The injection of new members has had a beneficial effect on the quality of sound blending younger voices with mature voices to create a noticeably richer sound. The year concluded with Christmas carols and songs at Holy Trinity Church supported by the women’s choir, Peterborough Voices, to a sell-out audience. Renewed success followed the appointment of Tim Knight as Musical Director and Matthew Lazenby as accompanist in 2014. The re-establishment of the choirs annual concert programme resulted in the spectacular concert’s The Best of British and The Spirit of Christmas in Leeds Minster, the expansion of the choir, registration as a charity, recording at the BBC and the development of a local concert series, which tours throughout Leeds in addition to the the two major concerts each year. 2015 included a performance at St Martin’s Church in Potternewton in aid of Saying Goodbye in July, Autumn Adventures as part of the Wetherby Arts Festival in October, Hollywood Heroes concert in June with the Phoenix Concert Band, which produced the first sell out in 11 years at Morley Town Hall. The year concluded with the return of the popular The Spirit of Christmas in Leeds Cathedral to record audiences. On 24 September 2016 the choir returned to Leeds Town Hall for Sounding the Century and were joined by British Ladies Barbershop Champions The White Rosettes and The Rothwell Temperance Band in a spectacular gala concert of voice and brass to capacity audience. The choir’s centenary will was celebrated in an exhibition in Leeds City Museum between November 2016 and February 2017 and concluded with The Spirit of Christmas at Leeds Cathedral in December. In 2017 the choir will perform in four concerts in Leeds, they also went on their first international tour in over 30 years. Travelling to Belgium, the choir performed in a variety of locations, including the Menin Gate at the Last Post Ceremony, which has taken place every day since 1928.